The New York Times published an article recently titled "Upbeat signs revive consumers' mood for spending". Signs of recovery are carefully being watched by those in the building industry and it will be interesting to see how many builders promote building green as a way to help consumers get back into the home improvement market. As consumers start spending, many see the desire for homeowners to make their homes more healthy and to make the systems that run their homes more efficient, a way to break out of the recession. See the interview I did with Mark DeMattei, of DeMattei Construction for the Sunset Magazine Dream Kitchen website talking about why building green makes sense in a down economy. Lydia Lyons: There is much in the news about the state of the building industry and how green building and remodeling is top of mind to consumers. How do you see De Mattei Construction moving into this arena? Mark De Mattei: It's an arena we've been in for a long time! The public's growing awareness of reduce, reuse, recycle is fantastic. It's top of mind in our day-to-day business and I think it's great that green building and remodeling is becoming top of mind to homeowners and consumers. 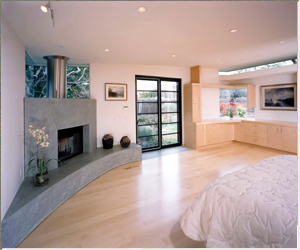 There are so many innovative materials, products and simple building methods that go a long way to making a home green. LL: What are some of your favorite green building materials that you are seeing? MDM: Products like tankless water heaters, HVAC systems with hepa-filters for better air quality, low or no-VOC paints, insulation made from recycled content and some of the products that the consumer might not even be aware of like concrete foundation made with fly ash and recycled by products, beams and framing material made from FSC-certified wood and recycled wood materials. Not to mention, all the beautiful tiles and countertops made from recycled glass and bamboo, etc. These are all products we have been using for years! LL: One of the things talked about in the press about this current recession is the fact that a homeowners interest in doing green remodels on their home will lead us out of this housing recession. Your thoughts? MDM: Right now is a great time to remodel. The downturn in the production housing market has left a lot of trades with a lack of work so the prices have dropped. De Mattei, as a general contractor, can pass that savings right to our customers. We are a LEED-certified builder and we can direct our customers to the best products and design to help our clients in the 'greening' of their existing homes. LL: What are some of the ways a homeowner can 'green' their existing home? 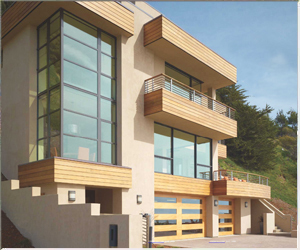 MDM: If it's a new custom home, its starts with the design and how the site is located. It then rolls into the specifications and products. In a remodel, using some of the products we discussed: tankless water heaters, upgrading appliances to energy efficient choices, removing carpet and installing hardwood or natural wool carpet in its place, and replacing windows with newer windows that feature Low E glass and offer a tighter insulation of the home. Just making a few of these changes goes a long way to keep the house cool in the summer and warm in the winter, reducing the need for using energy to run the heater or AC. 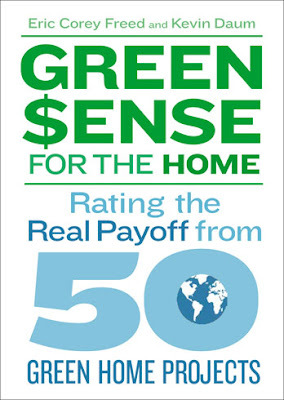 Architect and author and friend Eric Corey Freed, organicARCHITECT and Kevin Daum just released a book called Green $ense for the Home . The book is a great summary of practical, easy ways a homeowner can make their home more healthy and offers the list in a way that helps the consumer decide which items make the most financial sense. Such a great idea! you can follow the Eric Corey Freed on Facebook or on Twitter. I'm such a fan of TED. Everything they do is so timely, provocative and smart. I can geek-out on TED videos for hours. If you have 6 minutes to spare watch this video. It's about a scientist that decides to build green. She does a great job of explaining embodied energy and the returns of building green. Very worthwhile!